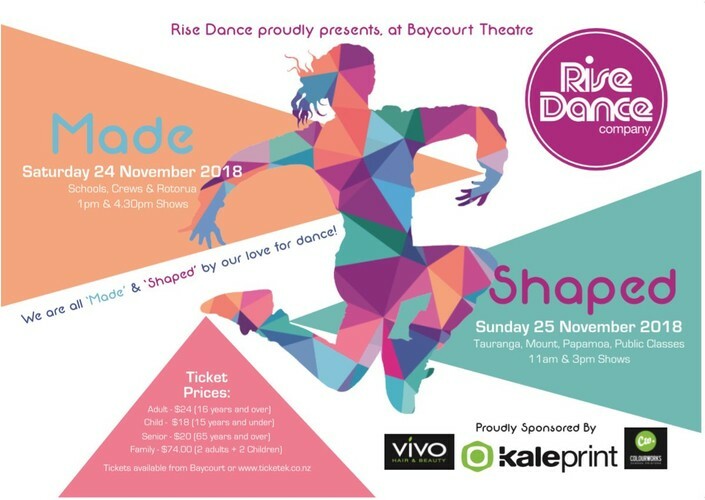 Rise Dance proudly presents our annual dance show "MADE" - Schools, Crews and Rotorua. We are excited to showcase our wonderful students (ages ranging 5yrs - adults) who work hard all year creating master pieces through creative dance. Styles of dance include hip hop, jazz, contemporary, acro and some of our amazing competitive crew performances. We are all 'Made" and "Shaped" for our love of dance! This year we are offering two identical Schools, Crews & Rotorua shows "MADE" Saturday 24 November 18 and two identical Tauranga, Mount, Papamoa & Public shows "Shaped" on Sunday 25 November 18. Come and support our love for dance! Tickets will be on sale soon at Baycourt.